This weeks Every Inchie Monday theme is fancy. Now, you might be wondering why I did an inchie with two dogs on it. Well, when we got our dog as a puppy she was really energetic and wanted to constantly play. On a walk we met one of our neighbors who understood how warn out we were. She invited Tia, our puppy, to come and play with her dog Fancy. That began a great friendship between the two and when we even said Fancy's name, Tia became excited. The beads are on the inchie because Fancy's mom gave Tia a collar with rhinestones to match one Fancy had. These two dogs were so far from being frou-frou that the collars were a joke. Unfortunately we have moved away from Fancy but if for some reason we have to say that word in front of Tia we say f-a-n-c-y so she doesn't get excited and think her friend is back to play. 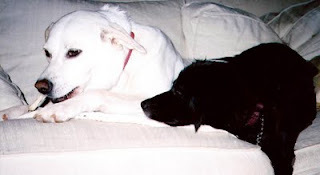 Here is a picture of the real Fancy (white) and Tia (black). If you read my previous post you know why I missed last Monday's inchie. The theme was pink and here is my version. Not only are the materials pink but I used my pinking scissors to "pink" the edges! 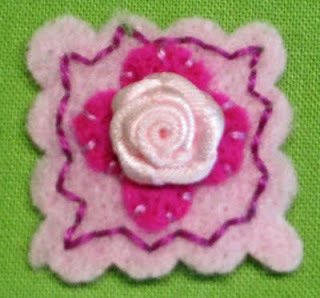 To see more inchies go to Every Inchie Monday! Loved your story and clever play on your fancy inchie. Your pinky inchie is pretty too! Super cute inchie and story Susan! Blessings to you and your folks. I understand the situation all too well. Great inchies Susan! I think the dog one is my favourite. The story behind the inchie is so touching. 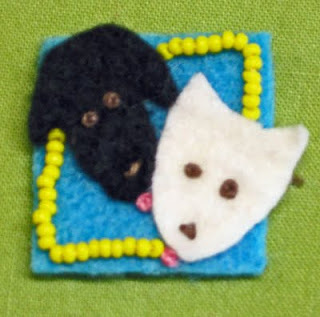 I love the story of Tia and Fancy - they make a perfect inchie. Your pink inchie is lovely. Now, this is really a wonderful little story and made me laugh. The puppies must have been sweet. And Tia is it still. What a sweet story & your inch says it all, so nicely done! Love your pinky from last week with your "pinked" edges lol! Love your inchies, and I enjoyed the story about Fancy and Tia. How cute is your adorable dog! I have a black mutt too and I think they are the best! We have to spell words around her also. Sometimes I think she even figures that out. Anyway, I love your cute as it can be inchie too!